The east end of H Street has a plethora of restaurants and bars with many different themes and atmospheres. Yet if you wanted a casual and quick meal or late night food after a night out on H Street, you were basically limited to Taylor Gourmet’s sandwiches (not a bad choice at all), pies, or venturing into one of the sketchier late night establishments that will serve you everything from Chinese food to fried fish from behind a bulletproof glass window. Fortunately, Shawafel, which opened Monday at 1322 H Street, has changed the game and filled a much needed niche. A quick serve casual Lebanese restaurant, Shawafel is located across the street from popular establishments like H Street Country Club and the Rock and Roll Hotel and down the street from Sticky Rice, Red Palace, and Toki Underground (as well as many others). This prime location makes it an excellent stop for anyone who doesn’t want to have a lengthy dinner but still wants quality food before going out. Its location near so many H Street bars and its late hours (3am Thursday-Saturday) will no doubt make it a popular place in the early hours of the morning for post bar food. Alberto Sissi, formerly of Jose Andres’s Think Food Group, converted what used to be a D.C. government building into Shawafel. Sissi has done a nice job redecorating the inside to create a pleasant atmosphere. Diners order their meal at the counter and can either sit on bar stools that line the wall on the right side of the restaurant or can grab one of the few tables on the left side of the restaurant. The food is prepared in an open kitchen behind the counter where diners can watch as their meat is delicately sliced off the roasting spit and placed into their dish. While the interior is fairly small, because it is a quick restaurant, hopefully seating will not be a problem most of the time. Diners who do not want to dine in the restaurant can also take their food to go. child, and he will focus on local sources for his meats and ingredients (the name Shawafel is a combination of two Lebanese dishes: Shawarma and Falafel). On opening night, he certainly did not disappoint. 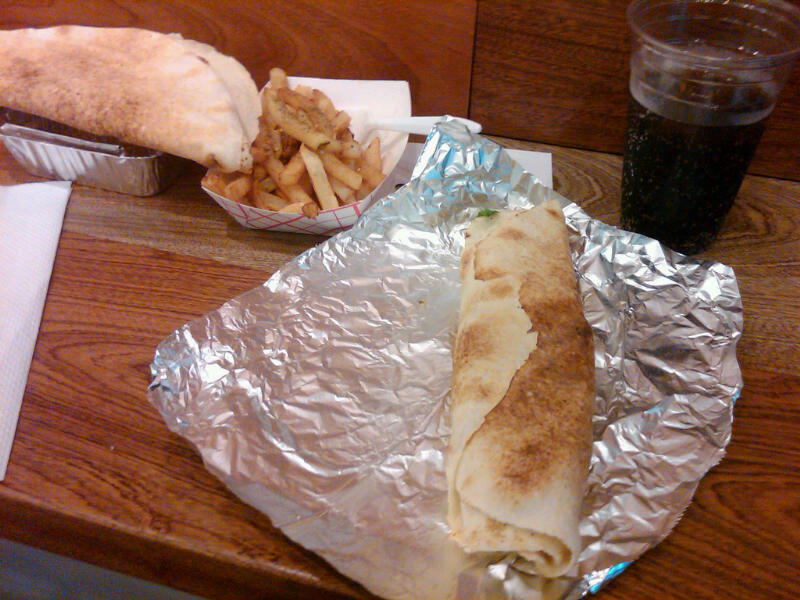 Both the Chicken Shawarma sandwich and the Shawafel Sandwich were very tasty. The chicken in the Shawarma sandwich had an excellent flavor that really highlighted the time it had spend on the spit roasting. The pickles added a nice sour hint that complemented and helped offset the strong garlic Toum sauce. The sandwich also included french fries–which might seem somewhat strange–but actually added to the taste of the sandwich. The meal came with a side order of fries topped off with a somewhat spicy seasoning. By themselves the fries were not the best in the world but will no doubt become a favorite of people who have had a fun night out on H Street (as will the French Fries sandwich which we have not yet tried). Be sure to get either a side order or Hommus or Labneh–for $4.50 you get a generous container and both taste great. We went on opening night, so there were obviously service kinks that can easily be fixed that we will not hold against the restaurant. With that said, we have a few friendly suggestions. While food does not have to come out at the exact same time, the restaurant needs to ensure that if two people order similar meals, the two meals do not come out close to fifteen minutes apart. Additionally, while we appreciate any place that serves both Diet Coke and Coke Zero at the soda fountain, considering the likely number of people who will come in late at night to eat after drinking, the restaurant probably should not place the soda cups next to the soda fountain as late night patrons may be tempted simply to fill cups without paying. 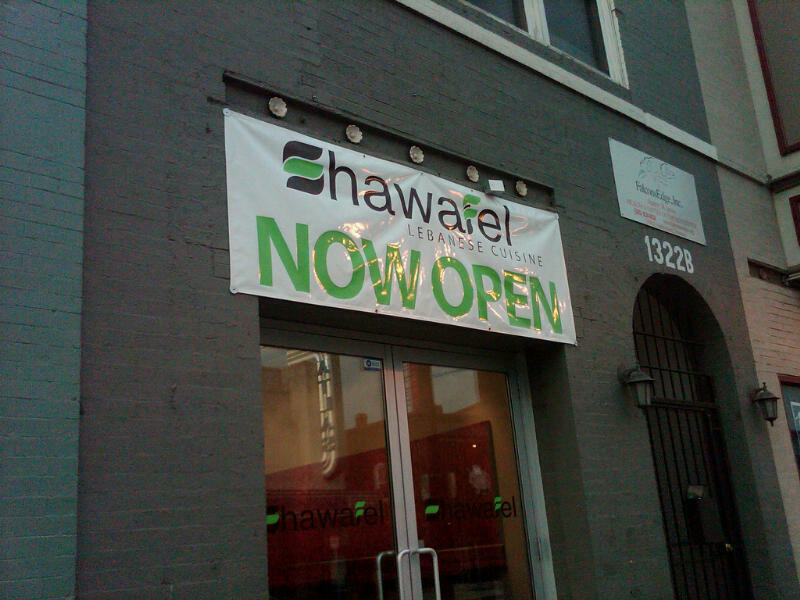 Shawafel provides another quality option for people going out on H Street who want a very casual, yet good, meal. We look forward to our future visits.